For the past year or so, I've been on a sourdough kick. I've committed myself to a mission of tasting as many sourdough breads as possible, in the ultimate search to find my top three. This also goes for baguettes too. As expected, I've had better luck with baguettes than with sourdoughs. There are just many more baguettes out there in circulation; more to taste and choose from. So far the sourdough that I like the most comes from Atwater's (in Baltimore), called San Francisco Sourdough. The crust is perfectly scored, crispy/crunchy each time, with a chewy and tangy interior, and just the right size of air pockets. Since I've heard so many wonderful things about Acme Breads in the Bay area, for breakfast, I picked up a loaf of their sour batard, some butter, and local strawberries. The crust was impressive and quite memorable, golden and crunchy, and resounding when you rapped on it. 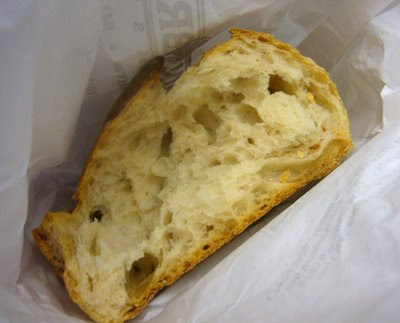 The inside had small air pockets (I would have preferred a less dense and meaty white part), but the gluten was well-developed and had a good chew. It turned out to be only mildly sour which was disappointing, but I still had no trouble in eating half a loaf by myself. The butter helped too. I grew up eating a lot of Russian sourdough bread, the kind made with rye and wheat flours, sometimes weighing up to 10 pounds, so my personal preferences point me to a tangier version. Acme's batard was definitely better than many loaves I've tasted. I also don't mind Boudin's small sourdough boule-type loaves, as opposed to their larger ones which lack flavor. The bread bowl in which they serve their signature clam chowder and their egg dishes for breakfast is the kind I like, with a nice crust and chewy center. If anyone knows of some amazing sourdoughs in the city, please let me know, and you'll be my friend for life. Since I had a flight to catch that evening, Mr.S and I had a quick dinner at Chaat Cafe across the street from his place. 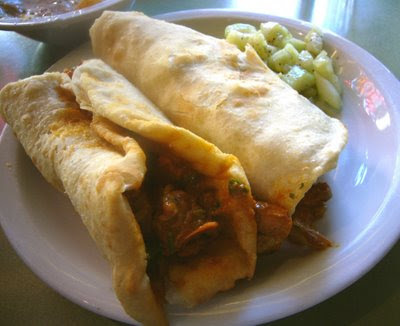 CC is known for their affordable and filling array of Indian street food, snacks and wraps. 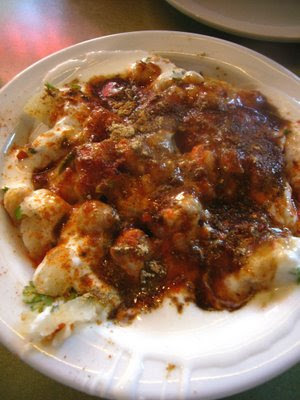 Instead of getting a samosa, we shared the papri chaat- thick, homemade fried-dough chips smothered with chickpeas, cubes of potato, tamarind chutney and yogurt. There was way too much gloopy yogurt involved, and not enough chutney, nor chickpeas. I also missed the usual sev that's sprinkled on top. Overall it was alright, but I missed the version served at Mehek. 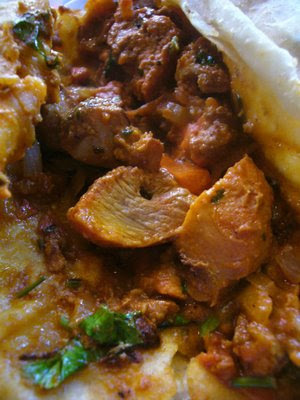 The tikka masala rolls were two huge bhaturas stuffed with stewed chicken tikka masala. The bhaturas were good, lightly fried, which made them warm and poofy. Though the chicken tasted good, it was very greasy, and hardly used any white meat. And since they were so big, I had to knife and fork it. 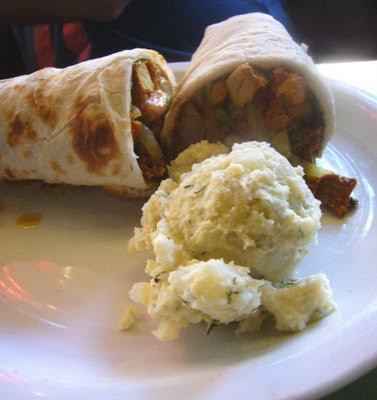 You also get a choice of cucumber salad or spicy potato salad with your wrap. My watery cucumbers had lost their crispiness and were surprisingly, really heavy on the black pepper. Mr.S's potatoes were more like a scoop of cold mashed potatoes than a salad. The predominant herb was actually dill. Is this an Indian herb? His desi chicken wrap was spicy tandoori chicken and veggies wrapped in baked naan. It tasted very much like my own, just with slightly more tomatoes, onion, and peppers. Again, it looked greasy, but the flavors were spicy and pretty good. There's not much to complain about. For $7 a piece, the portions were monstrous. I hardly finished even one of my wraps. The quality of the ingredients is so-so, but when you're starving, that aspect doesn't seem to matter much as does taste and portion. Like a reliable gas station, Chaat Cafe is a good place to get filled up. (And your daily requirement of spice.) Next time, I'll probably stay away from the wraps, and just order an array of their chaat and pakoras.